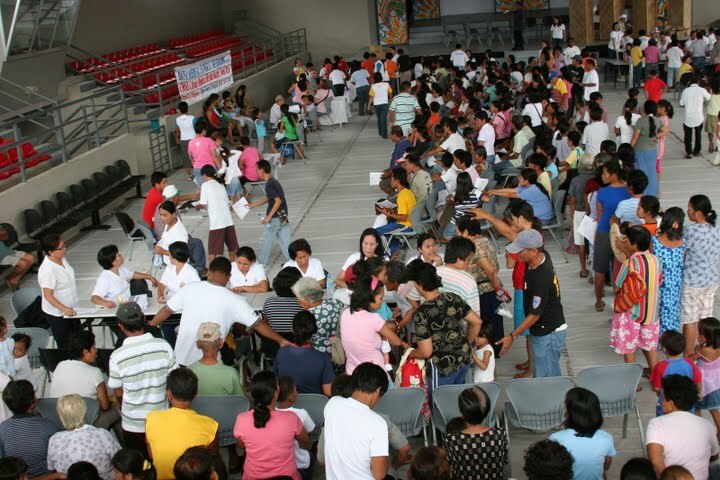 The 12th DAUSA Medical Mission held simultaneiously at the Danao General Hospital and at the air-conditioned Danao City Civic Center drew a huge crowd seeking help from volunteers for consultation and free medicines. 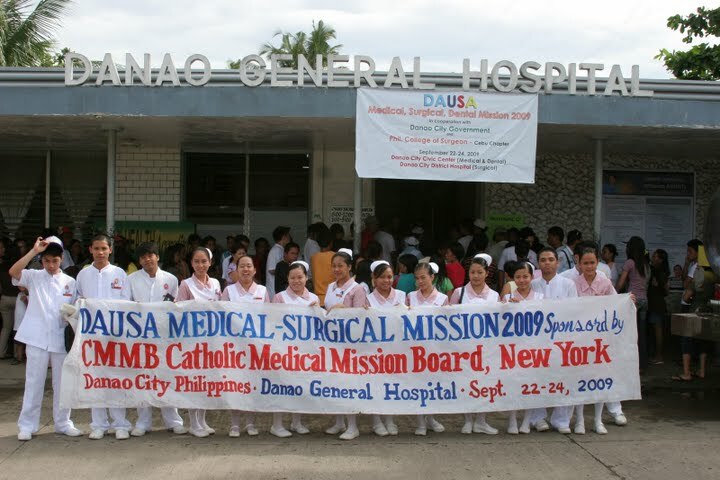 Meanwhile, in appreciation for the efforts and financial contribution of the members and officers of the Danao Association USA, Inc. as well as the participation of local medical practitioners and other volunteers, the Mayor of Danao City, Ramon Durano III, tendered a culmination dinner and distribution certifications of appreciatio at his residence in the evening at the last day of the Medical Mission on September 24, 2009. Earlier at known that day, all volunteers also got a barrio fiesta treat at lunch time at the farm of Barriga-Tomayao Family in Taboc, Guinacot, Danao City, hosted by the Barriga and Tomayao families. During the culmination dinner DAUSA President Marietta Palos experessed her profound thanks and great appreciation to the tireless efforts of surgeons coming from Cebu Doctors Hospitals and to visiting surgeons from the U.S. (Dr. Julian Banzon & Dr. Lorenz Alaan, the U.S. based and local nurses and all the volunteers who greatly contributed to the success of the 2009 Medical Mission. Medical Mi ssion Volunteers amd Balik Danawanons, who enthusiastically responded to the City of Danao’s Balik-Danao campaign enjoyed a very warm reception with the traditional welcome lunch held at the residence of Vice Mayor Ramon “Boy” Durano, Jr. 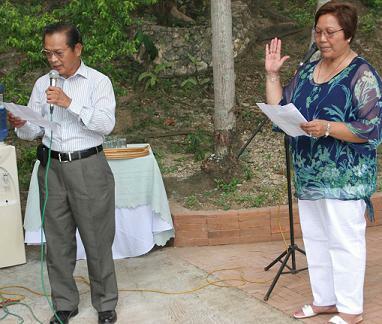 This year’s welcome lunch, as usual, was held on a Wednesday prior to the City Fiesta when most balikbayans arrived in Danao on the same early morning flight from the U.S. The fellowship lunch is an occasion where visiting Danawanons meet and renew acquaintances with city officials led by Danao City Mayor Ramon “Nito” Durano III. As always Danao balikbayans were fetted with sumptuous delicious dishes and native tropical fruits that most returnees had missed for a long time. Danao City Elementary School Childrens’s Rondalla was at hand to entertain guests with a very lively music. Further, after lunch, the newly elected DAUSA President was inducted into office administered by DAUSA Election chairman Fred Almeda. While all other new officers were induc ted during the association’s 16th anniversary and fiesta celebration in Long Beach, California, incoming president Marietta was already in Danao City helping out in the medical mission preparation. The Board of Directors agreed to have a special induction for Marietta during the welcome lunch reception where many DAUSA balikbayans and medical mission volunteers would be in attendance. The new DAUSA President pledged to fully support and continue the 12-year old Medical-Surgical-Dental and Educational Mission and make it more responsive to the health needs of the city’s indigent residents. Joining National Power Corporation in the early 80’s to practice my Electrical Engineering profession is a dream come true. I told myself that this is where I want to spend the rest of my working career. But the atmosphere has changed drastically in the mid 90’s as the move for privatization was gaining momentum. Once split and placed into the hands of a private sector, the once mighty government controlled corporation became not so attractive and stable for employment anymore. Taking into account that the children would be graduating in a few years time and faced with the prospects of unemployment added by the unabated graft and corruption in almost all sectors of society and the seemingly helpless government forced us to seek other options. With our plans finalized, we sent our immigration application papers to the Canadian Embassy on the latter part of year 2000. From some people I knew who immigrated to Canada at that time, processing took only six months to a year after which one would be ready to go. Coincidentally, our application was filed during the infamous impeachment trial of the then Pres. Estrada and for some reason, processing turned out to be snail paced. It was not until three years later that our application showed some progress. Eventually, in the following year we had our interview at the embassy followed by physical examination after which came the waiting period for the release of our visas. We were then ready to go by the middle of 2005 leaving behind our two children who, at that time, were graduating students of Silliman University in Dumaguete City. Some of our relatives in Iligan could not understand why we have to move, leaving behind our stable jobs which were the envy of others, comfortable home and the little luxuries we already had in life. With only Iza in tow, our youngest daughter who just graduated from high school, we arrived in Canada on July 20, 2005. The first few days were spent scouting for Iza’s school with only our friends both from work and school provided us the necessary assistance and guidance. In less than a month after arrival, I was able to find work in an automotive company doing final inspection work through the help of a friend. My wife was also employed in a department store as a sales associate. Even though my wife and I had more than twenty years in government service, we realized that we would not land on the same job we had back home. This time, reality DID bite. At the back of our minds, we continuously asked ourselves whether we made the right decision of moving here, considering that we are now in the middle stages of our lives. The reality seemed so hard to accept. We chose to rent an apartment closest to the school where Iza was accepted to avoid bus waiting times during cold winter months. Iza had her share of adjusting, too. Being a student leader back home, she was used to being active in school and surrounded by many friends. It was such a big change for her to feel so alone and all by herself in this foreign land. The first day had been terrible; she was snubbed by a fellow Fil-Canadian kid whom she expected to make her feel welcome after learning that they both came from the same country. Her first lunch ended up sadly in one of the cubicles of their school’s washroom. Things did improve in the coming days after she was able to befriend some Filipinos in the lower year levels and after a month or two became part of their school’s tennis varsity team. The first year had been very hard to adjust. So many times that the idea of going back entered our minds but Iza at this stage had made up her mind to stay. One of her arguments back then was that “the laboratory equipment that she only read in books in Pinas, could now be at her easy disposal “. She then told us that she was only going home after finishing her studies. The following year, RJ and Queenie (our two kids that were left behind) joined us after finishing their degrees. Finally, our family was complete and together we faced the ordeals of adjusting in a new environment with only by ourselves. We always instilled on their minds that this is the real world and they have to work hard in order to be successful in their respective fields. After a year in high school, Iza got accepted at the University of Western Ontario located in London, a medium city in Southwestern Ontario which was an hour drive from our place. In her first year, she experienced living by herself and stayed in residence (dormitory in the Philippines). However, during her second year she was not eligible to stay in residence anymore so she was force to rent an apartment with a friend. Eventually, we opted to move to London to save Iza the expenses she would be paying in apartment rental and food. We also decided to buy a house since my two-year working experience in Canada qualified me to a real estate mortgage. It felt like starting all over again, buying furniture and some amenities for the house, making new friends and getting acquainted with the new community. We ended up quitting our jobs because of the travel distance and had to look for another job. The only good thing was, there were four of us helping each other on this journey. I used to joke to my friends that I would take on a coaching role for my children, but I ended up as a playing coach and in a basketball game “first five” pa jud. After four years of struggle and still struggling, I am proud to say we survived what I think have been the critical part, also thinking that hopefully we DID make the right decision. We have adjusted to the ins and outs of living in the land of milk and honey (including surviving the cold winter). We had made a few visits to our cousins in Chicago, to our family and friends in New York and to my former high school classmates Roger and Haidee Remo in New Jersey. RJ, our eldest son, is now working in line with his field in Computer Engineering. 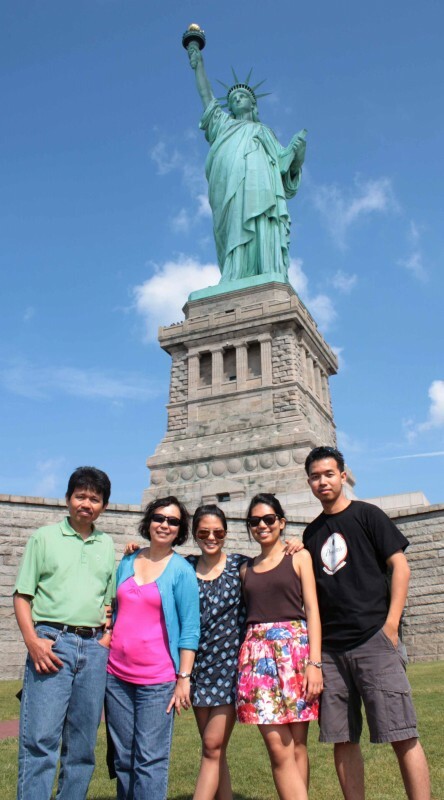 Queenie, the second child (an NCLEX and IELTS passer in the US) is working as a Registered Practical Nurse and is considering to take the one-year bridging program to become a full-pledged RN in Canada; at the same time, looking at opportunities in U.S. God willing, our youngest daughter, Iza who is in her last year of the Nursing Program will be graduating next year.